According to Google this is my hundredth post, and I've decided it's going to be about libraries. I’m a great fan of libraries, and often surprised by other people's low expectations. My youngest aunt, for example, was surprised that I managed to borrow a great fat hardback copy of A Brief History of Seven Killings from Wimbledon Library while it was still shortlisted for the Booker. They're also a great way to feed current obsessions, the latest being the Penguin Line books, borrowed one by one from Kensington and Wimbledon and shelved under 820 and 828 respectively. Kensington, thankfully, labels all it's books. Merton, including Wimbledon, only bothers labelling non fiction, and if an author is better known for crime than sci-fi then their sci-fi will be mis-shelved; but this is a minor annoyance, and mostly due to the Dewey decimal lumping all English fiction in one classification (823). Fiction, of course, is organised alphabetically by author's surname, but as in book shops, science fiction and crime tend to be separated out. Lately, with the Agatha Christie re-read, I've mostly been raiding the Crime section. I estimate it would have cost somewhere in the region of £400 already if it weren’t for libraries. The large duck egg coloured book at the bottom is Thomas North's translation of Plutarch's Lives. I actually borrowed this for an essay on Coriolanus, as it's generally agreed to be the main source Shakespeare used to write his play. North translated from the French translation, not the original Greek, and given he was writing in the mid 1500s, he wasn't as difficult to follow as I expected. Largely because although the sentence construction is sometimes odd, the spelling is more or less as we would spell the same words now. I haven't returned it yet because I want to read the whole thing. It's a Kensington Central Library book, part of their extensive collection of biographies, which sit like an iceberg 9/10ths beneath the surface in the stacks. Kensington Central Library has a number of other features I like as well - the large octagonal clock in the middle of the rows of shelves, the wooden alcoves in the windows with built in benches, the reference library upstairs with it's divided desks, and the regularly refreshed 'interest' shelves near the entrance. I also like The Library Time Machine, their blog on local history. Best of all it's very near where I'm working. In fact I haven't worked this close to a library for 15 years. Archway is on the Northern line, which had an asylum near the other end at Tooting (now flats) and the public receivership office, child and family court and for a while the benefits office at Archway. it's grimly unsurprising that it’s the line with the heaviest rate of suicide - and probably no coincidence that the Penguin Tube Line book for the Northern line is the bleakest I've read so far. For myself, I had grandparents living on that line, and as Camden is on it, and Waterloo, and it was my route home for ages, and is still in easy distance, I think of it as familiar and reliable. Unlike the Jubilee line, for example, about which I think nothing at all. The second book up in the pile is Margery Allingham's The Crime at Black Dudley. I've read a number of Allinghams, all of them with Albert Campion, but this is the first she wrote, and she writes him from the outside all through. The 'hero' of the story, the man with the love interest and through who's eyes we mostly experience the story, is Dr Abbershaw. The story is silly, and has perhaps some rather daft stereotypes, but it's also very well done and I lapped it up. The third, slim book is A Good Parcel of English Soil by Richard Mabey, It's the Metropolitan Line in the aforementioned Penguin Tube Line series. Mabey talks about Metroland and his own childhood, throws in some history. These books are exactly the right length for people to be slightly self indulgent without becoming irritating, and Mabey manages it here. Next is Music by Andrew Gant, which I've commented on elsewhere but can summarise as: not quite an introduction to the subject as there is some terminology and some written music, but great if you're an amateur like me. Then we have Resorting to Murder, one of the British Library's crime reprints. 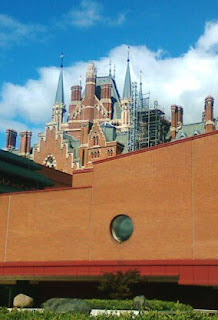 I'm actually a member of the British Library now, but so far I've mostly been there for exhibitions, in the evenings. To be honest I got a little fed up with Resorting to Murder. The anthology has never been my favourite format. I feel like I'm just getting into each story when I'm hustled on to the next. I enjoyed Silent Nights though, maybe because the Christmas theme held together better, maybe because I knew some of the authors and detectives from the first book. As you can see I've also recently taken out Capital Crimes and Crimson Snow too, but I've only read the first so far. At least one of the stories made me wince. Conan Doyle at his coldest. Another, with a lethal box of chocolates, two deadly snakes and five major coincidences all in about 20 pages, I had to grit my teeth to get through. Of course that's part of the appeal of libraries - I don’t have to own the books. I don't even have to read the books. Whereas once a book has been bought there's a vague sense of obligation to read it (especially if you like it). Library books are much more easy going. There may be a class element in that. I wasn’t raised with the idea of a 'canon' set of books everyone should read, or that books are inherently improving as and of themselves – actually a relatively modern attitude anyway - witness the antipathy towards novel reading in Northanger Abbey, which parallels modern concerns about computer games (Wimbledon Library have, or had, a book with a good defence of this, exploring what the attitude might be towards books had computers and games machines been invented first, but annoyingly I can't remember the author), or the moral panic about Jazz in that era (Humphrey Lyttelton's bio is good for information on this, and of course you’ll find that in Kensington Central Library stacks). Next up in the pile is George Orwell, A Life in Letters, which I can heartily recommend, and then another translation of Plutarch, less interesting and memorable than North, but perhaps more comprehensible to a modern reader, and lastly we have Kinsey and Me by Sue Grafton, which is from Victoria Library, where I used to go a lot when I worked at the Passport Office. Victoria Library has a very good sheet music section upstairs, but feels a bit squashed for space downstairs. There's rather a nice balcony running around though, where they keep the foreign language books. I think I've mentioned before how I used to sit in Chertsey library and read Grafton in my teens. Chertsey was a pre-fab, a supposedly temporary structure that's still there, like a lot of our old classrooms. We had a canteen made out of corrugated iron too. It must have been there years, but it seemed solid enough to us. The school libraries (we had two ends to the school, so two libraries) had some good books (H V Morton and Gerald Durrell, almost everything Judy Blume had written to that point), but opened completely randomly, which made borrowing books difficult and returning them worse. Middle school was quite different. I seem to remember it as wood panelled, although in retrospect that's incredibly unlikely, and I used to go in sometimes at lunch time and read Baba Yaga and other disturbing fairy stories. There are others, too many to do justice to really: The library in the Cobham old school building which never seemed to get any new books in and opened late one night a week when I was coming back from work. At that time the staff outnumbered the customer 2 to 1, but I expect it was livelier during the day when children were about. The mobile library we had before that, which used to park in the same place as the fish van. Streatham Vale library, strangely well stocked with socio-political books for such a small branch. Church Street, where I discovered Dorothy L Sayers, was another prefab, larger and more battered, hidden under an arch and a small passage from Church Street Market – another discovery that may have been cleaned up and gentrified now. Colliers Wood, which had flooded last time I saw it, sandbags piled up outside the doors. Brixton, which was founded, or at least funded, by Henry Tate. Charing Cross, squeezed in near the statue of Edith Cavell. Marylebone, which was under Council House, where confetti and occasionally champagne flutes would be left on the steps outside. I’m sure there are more I could think of (I see I've left University libraries out completely) .. and of course I don’t rely entirely on libraries. I also have a number of fairly full bookcases. But that’s another story.